Today Bob Pelkey and I traveled from Ft Myers across the state to Palm Beach County to visit Loxahatchee NWR. We were twitching today to find a lifer. I had dipped on finding a Smooth-billed Ani several times, but we knew about the highly reported pair of these birds being seen by many birders on the Marsh Trail at Loxahatchee. And today they were cooperative. We arrived just before nine a.m. and did not have to wait very long. There unique call easily identified their approach and were kind enough to pose for a few pictures. Lifers!! In our time here we also added a King Rail, Common Gallinules, Limpkin, Snail Kite, Black-necked Stilts and a few waders. Before leaving the refuge we checked out some muddy cells at the entrance where we saw a lot more Black-necked Stilts, Least Sandpipers, a couple Solitary Sandpipers, more Greater and Lesser Yellowlegs and many more waders. Earlier we had a slight delay when we spotted a flooded field on Sam Senter Road. We had many Black-necked Stilts, Greater and Lesser Yellowlegs, a couple of Least Sandpipers, Rosette Spoonbills, a Least Tern, some Mottled Ducks and all of the expected waders. As we were heading back toward home, we stopped to investigate some rice fields. Lots of Black-bellied Whistling Ducks, a trio of Fulvous Whistling-Ducks, more Yellowlegs, Black-neck Stilts and waders were seen. In a few weeks we'll return to the Everglades Ag Fields to spot the many anticipated migrating terns, gulls, shorebirds and grass peeps that should be arriving.. Maybe I can find some buff-breasted sandpipers, which is another bird i've dipped on in the past. It is getting harder to find lifers in my 'backyard', but today I was finally able to spot a Lifer in a rare to our-corner-of-Florida, American Flamingo. 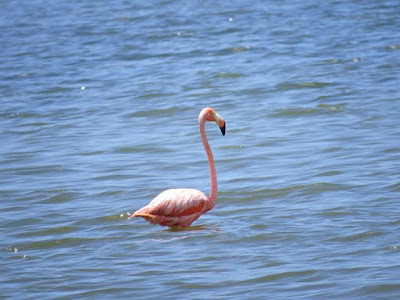 The bird has been reported for a the past few days, with Keith Laakkonen confirming the flamingo in the Estero Bay Aquatic Preserve. This site can be reached by kayak or by use of a spotting scope from New Pass at Lover's Key State Park, which is south of Ft Myers Beach. Even though the flamingo is an iconic symbol for the State of Florida they are infrequent visitors here, and escapees are always a possible status of some of these sightings. My first interesting bird seen when I arrived on site this morning was a Great White Heron. A white morph of the Great Blue Heron. These Great White Herons are normally seen further south toward the Everglades and the Florida Keys.